Through a specialized and focused set of service offerings and a culture that puts customers and their user experiences first, we provide results that are dynamic, technologically advanced, informative, and most importantly, easy-to-use. At NJMW.org, we do more than talk about preserving Jewish Memories; we offer an appropriate platform and solution to digitize, store and share stories and family history. Our Services provide customers traditional Jewish products and services for honoring the memory of loved ones with a modern approach. We also help partners offer a value add service to members, constituents, donor-base and congregants. NJMW.org is a place and community to share, honor and commemorate loved ones. We provide a memory sharing platform that can be used as you see fit, in particular for positive remembrance and commemoration. We use technology and the Internet to offer modern ways to preserve memories and honor centuries‐old traditions of commemoration. 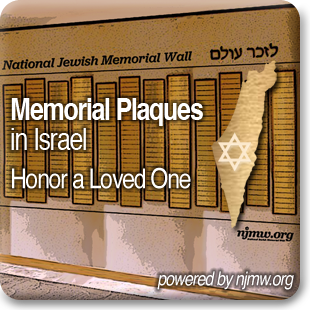 Here you can purchase Plaques 'in Memory of', Plant Trees in Israel, along with setting free Yahrzeit reminders. The Wall incorporates Jewish traditions to honor and commemorate the Yahrzeit and Yitzkor dates, together with your shared memories. These images and links are provided for use on your website and emails to your audience. Right click on each image to download. If you have any questions please email admin@nationaljewishmemorialwall.com or Contact Us.